This Friday, June 19th, is the 150th anniversary of Juneteenth – the day in 1865 that soldiers arrived in Galveston, Texas, to announce the end of the Civil War and slavery. Though the Emancipation Proclamation was made effective two and a half years before this date, it had not successfully be enforced throughout all of the United States until significantly later. Juneteenth is the celebration of the end of slavery throughout the US. In this week’s picture book, Mazie, a young girl, learns the history of Juneteenth and her great-great-great-grandpa’s freedom from slavery. 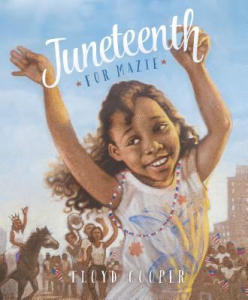 Juneteenth for Mazie shares this important moment in American history with beautiful illustrations and a simple but powerful personal account from Mazie’s father about their family’s journey to freedom.